I thank reader Gillian Zimmer for forwarding me this interesting piece, full of surprising information. It seems that millennials are leading every other demographic group when it comes to directing their dollars toward a healthier planet. 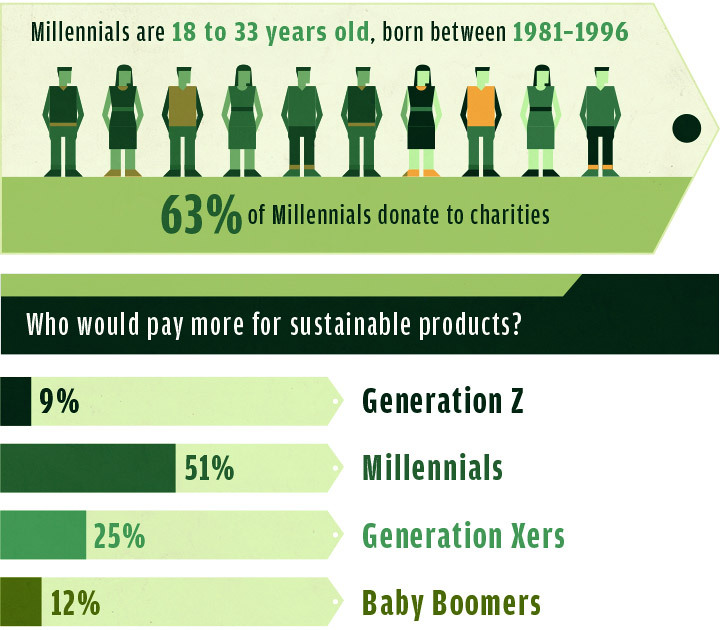 More than 50% of millennials say they are willing to pay more for sustainable products. In contrast, I am ashamed to report, only 12% of my own age group, the baby boomers, say they are willing to spend more for sustainable products. In a groundbreaking finding, Nielsen recently reported that the majority of the world’s consumers now prefer to buy products that are socially and environmentally responsible. Will this trend last? That depends on the individual consumer. Corporate social responsibility (CSR) is no longer a new or vague concept in the minds of global consumers. And the increasing number of people who are willing to pay extra for a “do-good” product is a clear sign that attitudes are changing. According to the Nielsen report, 55 percent of people worldwide will pay more money for products from companies “committed to positive social and environmental impact.” The report also found that 52 percent of people have done just that in the past six months, and 52 percent regularly check product packaging for proof of its sustainable impact. 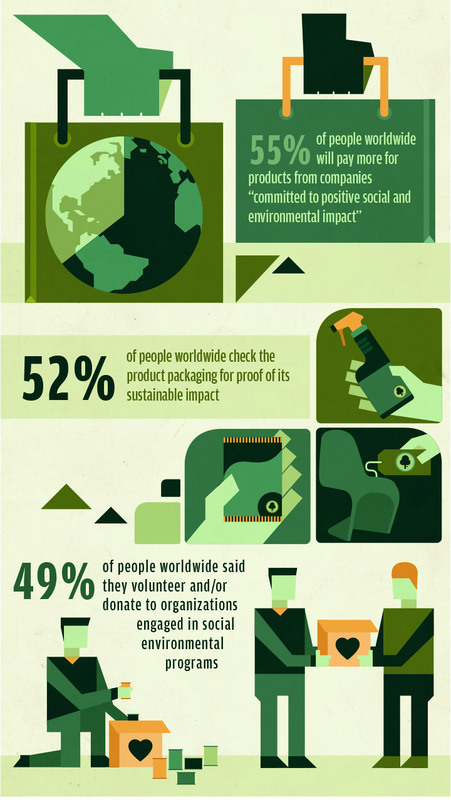 Worldwide, 49 percent of people volunteer and/or donate to organizations engaged in social and environmental programs. But will this socially responsible attitude become the norm? Or is it a passing trend? There’s no doubt that conscience-driven consumerism is on the rise. From 2012 to 2014, marketing agency Good.Must.Grow forecasted a 12 percent increase in the number of Americans who shopped for socially responsible products. Worldwide, Nielsen reported a 10 percent increase since 2011. This growth isn’t due to just education and awareness. It reflects the coming of age of the Millennial generation, whose members begin turning 35 this year and whose numbers have outpaced Baby Boomers. Though this generation has often been stereotyped as spoiled, fickle, and self-absorbed, the stripes they’re showing are very different indeed. Deloitte’s Millennial Survey 2014 paints a picture of a Millennials that are disappointed in business and government leaders, and expect improvement in social and environmental responsibility. Sixty-three percent of Millennials donate to charities and 51 percent—more than any other generation surveyed—told Nielsen they would pay extra for sustainable products. This doesn’t mean that other groups—Boomers, Generation X, and the under-20 Generation Z—are unwilling to make socially responsible purchases. But according to the Nielsen report, they are lesswilling. Only 25 percent of Gen Xers—less than half the number of Millennials—would pay extra for sustainable products. Boomers halve that number again, to 12 percent. Interestingly, Generation Z’s dedication is negligible - only 9 percent will shell out the extra cash. They may have fewer resources or they may not be dedicated to socially responsible shopping. How can sustainability and social responsibility become more entrenched? 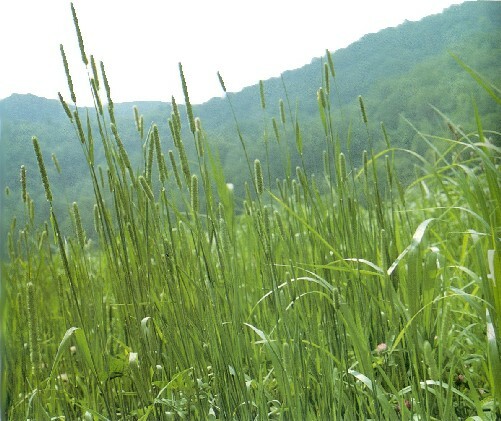 Eradicating “greenwashing” May help. It’s no longer enough to slap a green flower on a toxic product. Consumers often feel betrayed by companies whose actions don’t match marketing, and that cynicism may pose a threat to brands who truly fulfill sustainable claims. CSR-driven companies need to continue evolving, too. Good.Must.Grow urges socially responsible companies to move beyond purpose and create a competitive customer experience. For on-the-fence shoppers, responsible products are beginning to compete effectively with conventional ones, but must focus on innovation in order to present a real threat. 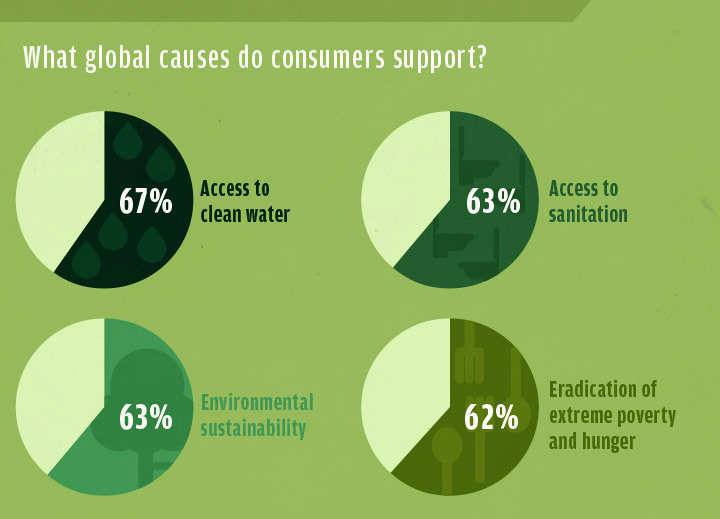 What worldwide causes do consumers support? An overwhelming 67 percent are chipping in to increase access to clean water. Access to sanitation ties with environmental sustainability at 63 percent, followed by eradicating extreme poverty and hunger at 62 percent. For North American and European consumers, the prioritization of clean water and sanitation—things we often take for granted—may be surprising. But, Nielsen reports that Europeans as a whole have the lowest level of interest in socially responsible shopping (40 percent), with North Americans just two points higher. That’s a big jump from the 18 percent of Americans who would have chosen sustainable products in 2011, but it’s still over 20 points behind the rest of the world. Good.Must.Grow reports that Americans are in an even three-way split: One third of us actively seek to do good through our purchases; one third think it’s important but do not plan to increase their dedication; and one third don’t think it’s important or don’t pay attention. The most socially responsible region of America: the Midwest. Why the disparity? There are endless theories, but Good.Must.Grow reports that the main thing holding Americans back from responsible shopping might be that we just do not know what social responsible products look like, how to find them, or where to get them. Worldwide, Americans and Europeans score lower on two interesting fronts: We’re less likely to check product packaging, and less willing to talk with family and friends about products and brands. Where roughly 62 percent of shoppers in Asia-Pacific, Latin America, the Middle East, and Africa read product packaging to find evidence of sustainability, only 36 percent of Europeans and 32 percent of Americans do the same. Even more surprising, only 29 percent of Americans and 28 percent of Europeans talk with their friends and family about the brands and products they trust. If the problem facing consumers in a lack of awareness, then there’s a clear opportunity for individuals to effect change just by talking with peers about socially responsible products, how to find them, and how to verify that they’re legitimate. If you’re reading this article, you probably have at least some interest in socially responsible shopping. That gives you an important role to play in the cycle, aside from just voting with your wallet. Want to see this shift in values become a lasting, even permanent change? Then become an advocate for the companies and products you truly believe in. Change does start at home—that includes your own. J.H. Fearless is a blogger and writer whose work explores the intersection of art, nature and culture. Her blog, “Uprooted,” won the Tripbase Eco-Travel blog award in 2009 and 2011. 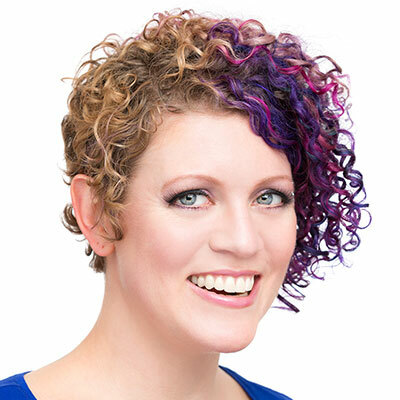 Her work has been featured in The Huffington Post, Burning Man, National Geographic’s Green Living Website, Sharable and many more notable publications. Currently, she lives in Reno, Nevada, where she spends her time learning to garden in the desert and blogging for Burning Man each September. It is early fall here in our forest. Most of the maples are preparing to end the year in a blaze of color. The green in the sugar maple’s leaves is retreating, exposing hints of orange that will soon brighten and spread. The red dots on the tired-looking leaves of the red maple will soon take over, and build to a feast of red. But one maple is not joining in the show. The poor striped maple, or moosewood, will not add a blazing swan song to the forest, like the other maples. The little tree’s large green leaves have no brilliant touches that will spread in splendor. Instead, the leaves of this forest tree are dying an ignominious death. While a portion of each moosewood leaf is turning yellow, that yellow is pocked with holes and splotches of dark green or brown. Portions of many of the leaves are brown and shriveled. Every fall I have wondered why the moosewood leaves are uniquely ugly in their dying. If it weren’t the same every year, I would wonder if this year the moosewoods are diseased. But no. This fall is like every other. Maybe we humans can relate to the moosewood in the fall. Unlike the leaves on the sugar and red maples, we are not at our most gorgeous when we are approaching death. Most of us, in our last days, are more like the striped maple’s leaves–shriveled, perhaps discolored, declining unevenly. You are currently browsing the Earth Connection blog archives for September, 2014.